If you have been involved in a motor vehicle accident, a whiplash injury can occur and should be not taken lightly. In a lot of cases, there are no symptoms, such as pain or stiff, right after the car accident. Sometimes, it can take weeks to months for the symptoms to manifest. 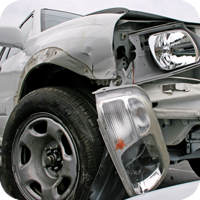 Whiplash is, by far, the most common injury to the neck and back during an auto accident. This is caused by a sudden movement of the neck, either forward, backwards or sideways. Without neck pain, back pain, or stiffness, it is easy to think that one has walked away from an accident unscathed. However, research has shown that an impact as little as 5 mph can cause damage from whiplash to the joints, ligaments, muscles, and other tissues. This damage can further predispose that area to debilitating and permanent disc and joint issues. Don't just sit back and not seek treatment, even if someone has told you the pain will go away on its own. You would be doing a disservice to yourself and your health. You owe it to yourself to have a spinal and/or extremity checkup in order to avoid future issues. Contact the office today for your Chiropractic checkup!